The FD Mediagroep hosted the Personal Finance Day at the Kromhouthal. The Financieele Dagblad organized this day in collaboration with its partners to inform and advise readers and other interested persons in many different ways about their financial future. The Affordable Art Fair is a company that organizes art fairs across the globe with one goal: making art affordable for everyone. The art fair has been hosted in the Netherlands for twelve years and the Kromhouthal is the Dutch venue that has the honor of hosting it since 2013. 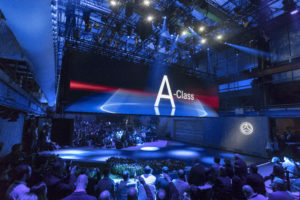 The Kromhouthal recently hosted one of the most spectacular events in its already impressive history as an event venue: the product presentation of the new Mercedes-Benz A-Class. An event for which nothing was left to chance and the Kromhouthal could really shine in all her raw, industrial glory. The Gault&Millau Awards were recently presented in the Kromhouthal. The event was coupled with the presentation of the renewed Gault&Millau Restaurant Guide 2019. Gault&Millau was looking to impress with the event to put the company on the map as a leading restaurant guide.